The dam at the Old Forge Pond outlet releasing four cubic feet of water per second during the current season of low water. Many visitors and seasonal residents looking to spend the Memorial Day weekend boating on the Fulton Chain of Lakes found themselves dismayed at water levels that were more than a foot below normal for this time of year. “Having traveled 2,500 miles to enjoy our summer at camp in Old Forge was I ever surprised to find nothing under my dock on the Channel but mud,” David Lemire wrote in an email to The Weekly Adirondack. This entry was posted in admin and tagged Fulton Chain, Low Level waters on May 28, 2015 by Jay Lawson. 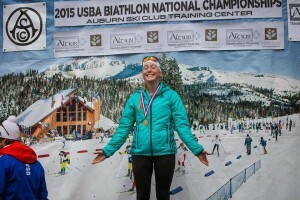 Maddie Phaneuf of Old Forge was recently named to the U.S. Biathlon National X-Team for the second consecutive year. 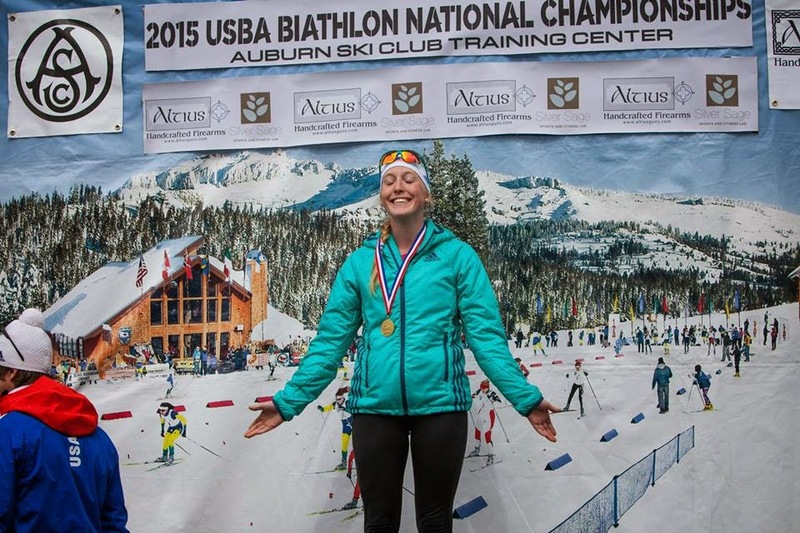 This entry was posted in admin and tagged Maddie Phaneuf, National X-Team, U.S. Biathlon on May 28, 2015 by Gina Greco. The Town of Inlet will host a Bass Derby that will be held Sunday, June 28. Contestants will fish the waters from Fifth Lake to Old Forge Pond for eight hours in hopes of catching the magic winning weight. This entry was posted in admin and tagged Bass Derby, Inlet on May 28, 2015 by Gina Greco. The first in a series of First Friday Art Walks in Old Forge on June 5 will feature six venues for art lovers to shop, eat, listen to music, meet artists and view demonstrations from 5 to 8 p.m. This entry was posted in admin and tagged Artwalk, first friday on May 28, 2015 by Marianne Christy. The Webb Property Owners Association (WPOA) board meeting will be held Saturday, June 6 at 10 a.m. in the Senior Room at the Inlet Town Hall. Agenda items to be discussed include recent events at the Town and School levels, and the future of WPOA. This meeting is open to the public and an opportunity to learn how you can become more involved in WPOA. This entry was posted in admin and tagged WPOA on May 28, 2015 by Gina Greco. Petitions are currently available for pickup at the office of Town Clerk Nanci Russell for those interested in running for various Town of Webb positions in the 2015 elections. This entry was posted in admin and tagged Webb Politicians on May 28, 2015 by Gina Greco. Niccolls Memorial Presbyterian Church is taking orders for the Food Sense package for June. Each “unit” costs $15.50. This program is open to all. There are no eligibility requirements nor is there any obligation to purchase food every month. This entry was posted in admin and tagged Food Sense, Niccolls Church on May 28, 2015 by Gina Greco.